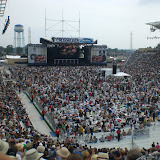 I attended the Eric Clapton Crossroads Guitar Festival this past Saturday at Toyota Park in Bridgeview, IL. What an incredible day. There were so many great players and jams. My favorite set of the day was Derek Trucks. Great band. Jeff Beck and John McLaughlin were also awesome. And Albert Lee was on fire with Vince Gill's band. The Guitar Village was really cool too. Fender, Gibson, and Ernie Ball all had booths setup where you could play their various guitars. I took a ton of pics and uploaded them to a Picasa web album. I wasn't close enough to the stage to get any great pics, but they're not bad. I took a lot of shots of the video screens too. Some of the pics may seem redundant, but I basically uploaded everything I had. Click the pic below to see the album. GREAT PICS OF 2007 CROSSROADS CONCERT. I WAS THRER BUT BACK IN THE SEATS. THIS YEAR I WILL BE ON THE MAIN FLOOR. HOW DO YOU GET CLOSE TO THE STAGE? ARE THERE ANY SPECIAL PASSES TO THE FENCED IN AREA BY THE STAGE OR IS IT FIRST COME FIRST SERVE? I'm not sure how you get into that fenced in area. I think those were VIP seats. great pictures! I'm planning on attending this year's!! thanks for the heads up on the waiting line to get in! If anyone who has stood in the main floor in previous concert would share comments on how that worked out, I would appreciate it. Thinking about getting tix, but wonder about 12 hours with no seating. Thanks! I was on the ground level for the 2007 show and had no problems. You'll want to bring a blanket and stake out an area when you get there. I alternated between standing and sitting. I'll be doing the same thing this year.